Onkyo TX-NR3008 review | What Hi-Fi? Admittedly it’s already a big box (20 x 44 x 46cm, in fact), but Onkyo has taken the opportunity to pack the TX-NR3008 with so much functionality that, in the end, it’s mildly surprising that this leviathan didn’t have to be even bigger. Let’s have a quick skim through the highlights of its extensive specification. 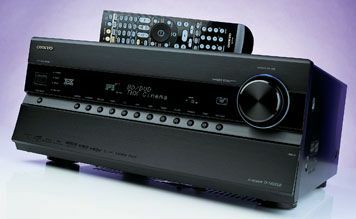 Eight HDMI inputs (version 1.4a to support 3D and Audio Return Channel) and a pair of outputs should prove sufficient, for starters – and there’s a stack of lesser connectivity, both video and audio, too. Then there’s its THX Ultra 2 Plus certification, networking ability (the Onkyo will stream audio files from MP3 through FLAC and on to LPCM), consequent internet radio connectivity (Last.fm and Napster are on the menu), and outputs to one additional video zone and two audio zones in addition to its nine channels of amplification. And that’s before we get into power (ample), construction (substantial) or ergonomics (painless). So far, so really quite impressive, then. And given the DTS-HD Master Audio soundtrack to Unstoppable to deal with, the good news keeps on coming. The TX-NR3008 generates a spacious, seamlessly integrated soundstage, steers and sites effects upon it with the sort of unquestionable authority more readily (once) associated with military dictatorships. The traditional Onkyo virtues of significant drive and attack, implacable low-frequency solidity and vaulting dynamism are strongly evident, but here they’re joined by a level of refinement and subtlety that makes the TX-NR3008’s overall presentation one of benign muscularity. Dialogue is detailed and distinct, the top end attacks crisply and the Onkyo envelopes the listener convincingly. Music, which so often exposes even the best multichannel receivers as one-trick ponies, is handled confidently (and with some competence). James Blake’s Limit To Your Love is delivered with ornament-rattling bass presence, the Onkyo managing to maintain its stance of power with refinement under even extreme provocation. Tonally and texturally the TX-NR3008 offers good detail and variation, and it sounds genuinely deft through the midrange. It’s not the last word in musicality, though. Organisation and the relationships between different sounds competing for primacy on the stage could be better, and there’s no denying the rather lumpy way the Onkyo deals with testing rhythms – but by the standards of its peers the NR3008 is among the more invigorating two-channel listens we’ve encountered. Beyond its rather baleful physical presence, then, there’s very little to stop you putting the TX-NR3008 near the top of your short-list.